QuickBooks Online makes it easy to manage payroll taxes. The payroll process doesn’t end with preparing and producing paychecks. On a schedule determined by the IRS, you need to remit payroll taxes and file payroll tax returns. Using rules established by the IRS, you pay payroll taxes weekly, monthly, or quarterly, depending on the amount you owe (called your payroll tax liability). You must make Federal tax deposits by electronic funds transfer. Most people make Federal tax deposits using the Electronic Federal Tax Payment System (EFTPS), a free service provided by the United States Department of Treasury, and QBOP makes use of the EFTPS. To pay your payroll taxes, choose Taxes → Payroll Tax to display the Payroll Tax Center. Once you’ve paid employees, the Payroll Tax Center displays taxes that are due, along with their due dates and e-payment cutoff dates. You can preview how much you owe by printing the Payroll Tax Liability report; click the View Your Tax Liability Report link on the Payroll Tax Center page. 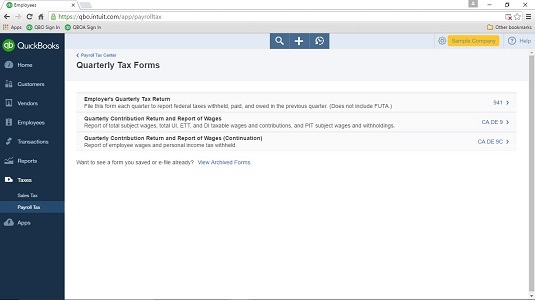 When you click the Pay Taxes button, QBO displays the Pay Taxes page, which shows payroll tax amounts that you owe to various taxing authorities and when the payments are due. Your payroll tax liabilities, separated by payroll tax authority. If you “look ahead” — that is, opt to view payroll tax liabilities before their due date — the amounts you see are estimates of your liabilities. When you click the Create Payment link beside a line, QBO shows you the amount you owe, allocated by tax item. At the top of the screen, you can opt to pay the liability electronically using EFTPS or make the payment yourself. If you’re entering historical payrolls to set up accurate payroll information for the current year, choose to make the payment yourself (because you’ve probably already made the payment and you simply want to record it in QBOP). This example shows a sample company, and this potential payment a few days after it was due. 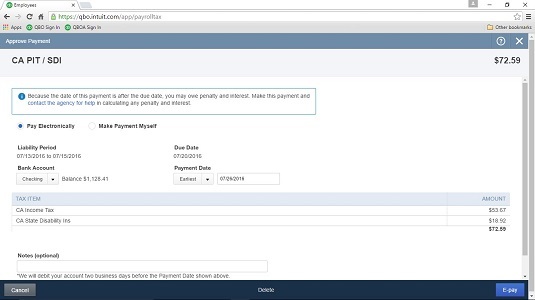 So, QBO displays a note at the top of the screen indicating that late payments might be subject to interest and penalties and providing information on what action you should take. When you finish reviewing the details for the payment, including the payment method (electronic or manual), the bank account from which you’ll make the payment, and the payment date, click the E-pay button or the Record Payment button (depending on whether you’re paying electronically or making the payment yourself) in the lower right corner of the screen. QBO displays a payment confirmation window that describes the payment method, type, liability, due date, payment date, and payment amount. Repeat this process for each payroll tax liability. Quarterly, you must complete and submit a federal payroll tax return using Federal Form 941, which identifies the total wages you paid, when you paid them, and the total taxes you withheld and deposited with appropriate taxing authorities throughout the quarter. The IRS permits you to file the form electronically or to mail the form. If you live in a state that imposes a personal income tax, then you typically must also file a similar form for your state; check your state’s website for the rules you need to follow for payroll tax reporting. Your state probably has a state unemployment form you need to prepare and submit as well. When you click Quarterly Forms on the Payroll Tax Center page, QBOP displays the reports you need to prepare and submit. The payroll tax returns you need to prepare and submit appear on the Quarterly Tax Forms page. Click the link to the right of each form, and QBOP displays a page where you can opt to file the form electronically and preview the form. Click the View button to preview the form, and it appears onscreen, prefilled with information. The form preview also includes a set of tools that you can use to review, save, and print the form. And, as you scroll to the bottom of the form, filing instructions appear. 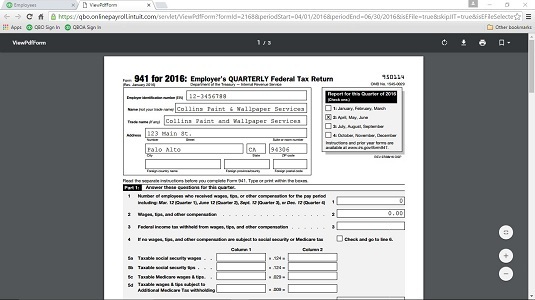 A sample Federal Tax Form 941 used to report payroll tax information to the Federal Government. Repeat the process of reviewing and printing each form as appropriate.